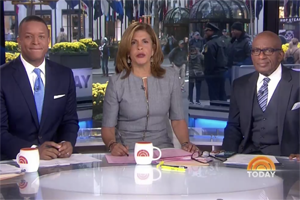 ”We are starting a new chapter in the third hour of our show,” Hoda Kotb began the 9 a.m. hour, titled Today Third Hour, joined by Craig Melvin and Al Roker. Megyn Kelly's name wasn't mentioned. (Savannah Guthrie was in Pittsburgh to report on Saturday's synagogue shooting.) As Variety reports, "to ease the transition, NBC had Jenna Bush Hager stationed in Studio 6A, the studio that has been used to broadcast Megyn Kelly Today live. She picked up host duties after the show’s first 20 minutes. Producers wanted to close the first two hours as they always have – from the home base, Studio 1A – so they kicked off the 9 a.m. hour there." Hager was joined by Melvin and Roker as they did live segments about cooking and Halloween before a studio audience. Kelly's old set is expected to be used for much of Today's third hour going forward. As Lloyd Grove notes, "the drama surrounding Kelly—which had overwhelmed cable and social media for most of last week—was very much beside the point on Monday. Perhaps unavoidably, the inaugural Megyn-less program was a strange hodgepodge of grave foreboding and forced bonhomie."